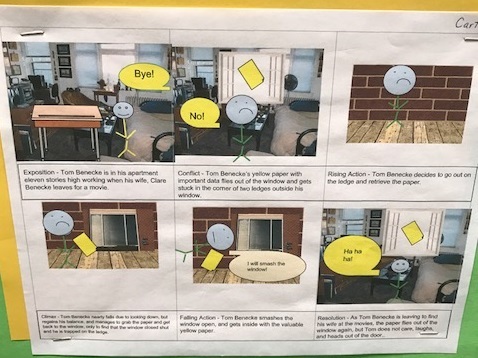 This was a really effective lesson I did with my 5/6 combo class to work on several skills: listening comprehension, annotating text, identifying plot elements, plot diagramming, and using technology (Google Drawing). It took about four class periods, and my kids learned a lot and had a great time. Step 1: Choose a short story and read it aloud* to your students as they take notes on a printed copy. You could really use any short story that is in your curriculum, but that’s the one that I found and it worked out great. Step 2: MODEL how to annotate the text as it is read aloud. I gave my students highlighters and pens/pencils. Obviously if you have textbooks, you can train your students to use sticky notes to “code” the text while they read. I loved letting my students actually write directly on the text. We talked about what kinds of notes we could take as we listened to the story. We talked about how to circle, underline, highlight, write in the margins, etc. We talked about making sure to note important information, especially things involving characters, setting, conflict, etc. I started out with a paragraph at a time. I played one paragraph of the audio while I had the students watch me take notes. I then paused the audio, discussed what notes I had taken and why, and allowed for the students to take their own notes (or copy mine). After modeling the first page or so, I had students make their own notes as the audio played. I would definitely recommend pushing pause after every paragraph to give students ample time to catch up. It’s also good to stop and have discussions about what is going on in the story, let students give their predictions, etc. I’d recommend making sure that all of your students are engaged by walking around while the audio is playing and look to see what your students are writing down. Some of my students needed encouragement to write more, or “code more”, so continue to model and guide as needed. Step 3: Decide if you want to have students complete the rest of the annotating as part of their homework, or complete it in class. There were many reasons why I decided to have students complete the work in class as a whole group instead of as homework. I work in a unique program where homework completion is elective. I wanted to make sure that EVERY student had heard the entire story and been present for our discussion. The story was 48 minutes when read aloud, so it took about 2 class periods with pauses for annotating and discussion. Step 4: Have your students take notes on plot diagramming. I introduced my students to 6 terms and had them take notes inside of their ELA notebooks. You could also modify this step by providing a list of the terms – it just depends on how much time you have. The 6 elements we cover are: exposition, conflict, rising action, climax, falling action, and resolution. Step 5: Identify the plot elements in your short story. 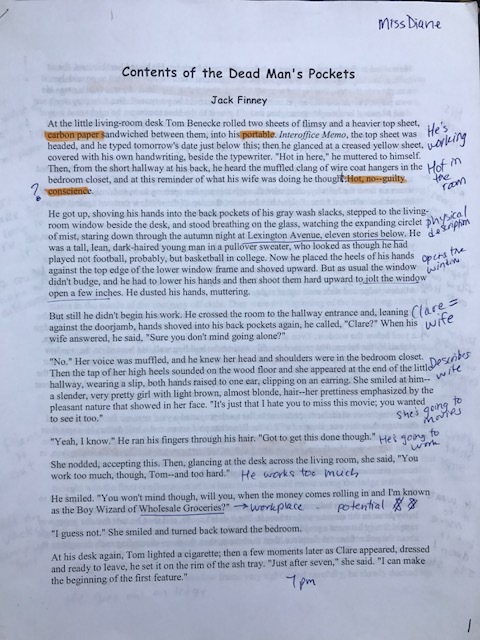 Now is the time for your students to connect the six elements of the plot diagram inside of the short story you read aloud. When I did this with my class, we had a discussion about each element. If I had to do this again, I would definitely have students use their annotated story to identify these elements as we discussed each one. For example, they could get a different colored highlighter or pen to circle, or note each of the 6 plot elements. 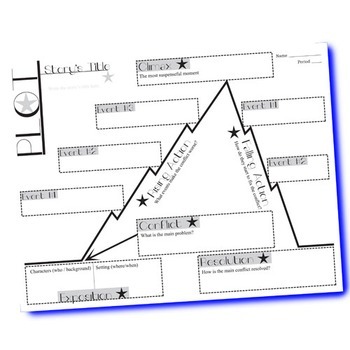 You could have your students use a plot diagram graphic organizer. Here is an awesome plot diagram graphic organizer from Created for Learning that would work really well for any short story. This will set your students up for success with the next part. 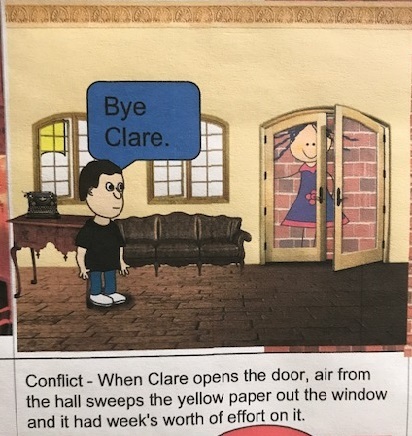 Step 6: Have your students use Google Drawing to demonstrate understanding of the 6 plot elements. We were running out of time before we needed to start our next unit, so I had students share their Google Drawing with me. I gave each student some feedback on their rough draft, and then I had my students complete their final edits at home. We have a small class, so we were able to share the Google Drawings on the document camera during the final class period. The kids loved seeing how their classmates used Google Drawing to represent their plot elements. You could definitely extend this activity by having students repeat the process with a different short story. After completing this activity, my class wrote our own short stories using this character interview lesson plan.